Kenji's here for a couple weeks. You might also know him as Tres. 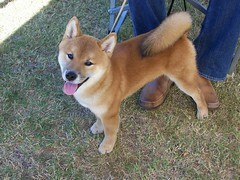 He is the third puppy from Tama's last litter. He's a very calm, sweet puppy that follows you around wherever you go in the house and lays beneath your feet while you are working at the computer. I worked with him a little with the show leash to see how he'd do. 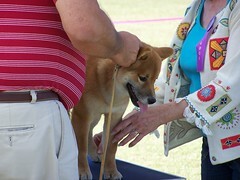 OK, the calm, sweet puppy turned into a raging lunatic as soon as he felt that show collar tighten up around his neck. He is his mommy's son that's for sure. Tama still doesn't like anything around her neck. We got through the show scene showing on a REALLY loose leash. 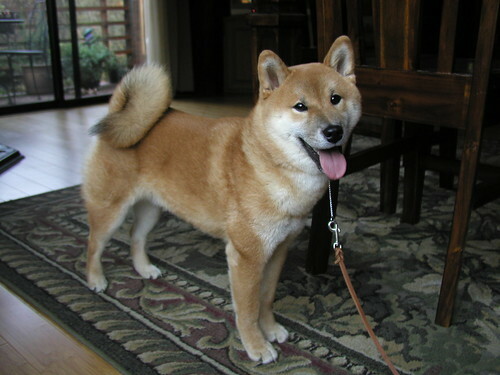 Good thing that's in the shiba standard - they are supposed to be shown on a loose leash! There's still a few more weeks to work on it. In the meantime, he's doing really well with learning stand. Here's a photo of the dreaded show leash and a very pretty boy attached to it. Isn't it amazing how much he looks like Trixie? Kona is the puppy that went to Arizona to live with my friends Valerie and Jeff. They took him to a fun match this weekend. Kona did awesome and I heard a bunch of complements on what a nice puppy he is. My friend Wendy sent me these pictures of him at the fun match.